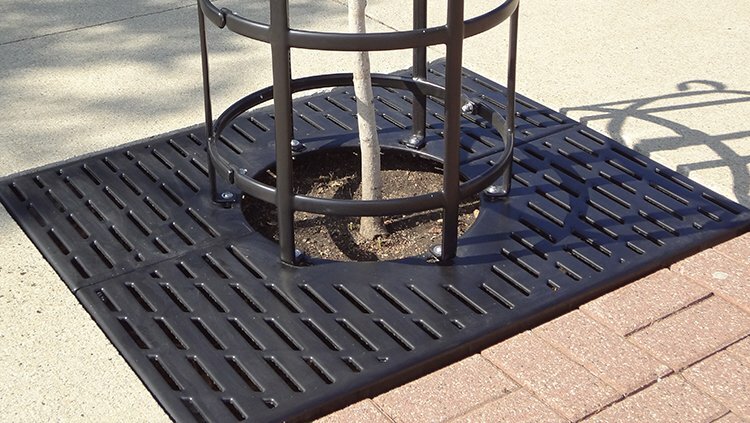 The Premier Advantage: Commercial Tree Protection Grates and Guards built with Heavy-Duty Durability. They look great and are manufactured to last a lifetime in ALL climates. 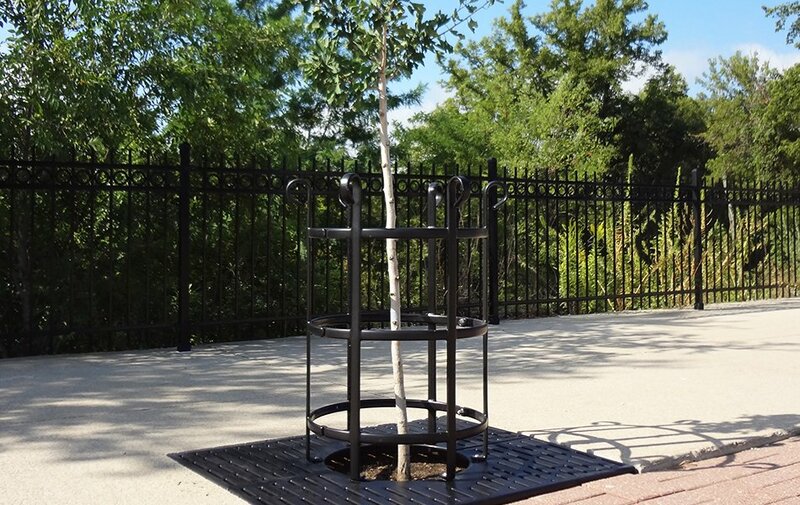 Create a beautiful landscape design with commercial tree protection using our durable grates and guards. Unique in quality and strength, these tree protection products are a perfect complement to any landscape design. 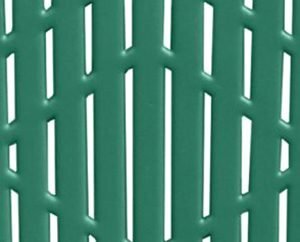 Tree grates and guards are made of durable steel and are 100% coated with plastisol (poly-vinyl) in one of twelve standard color offerings. 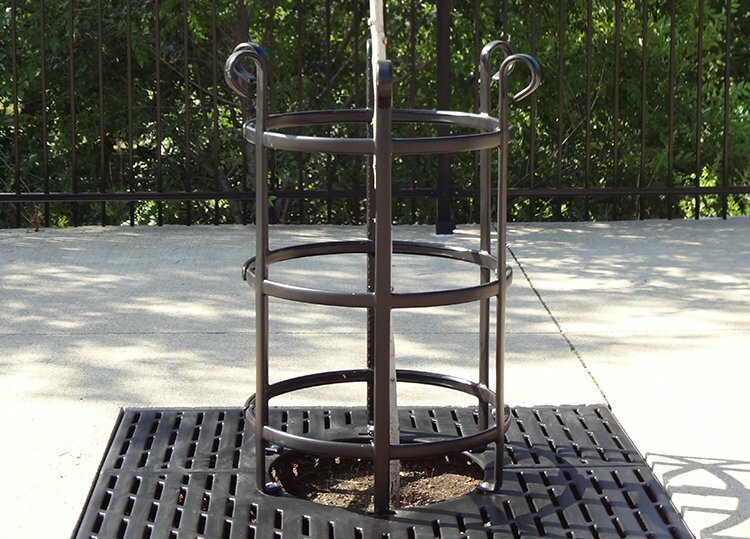 The two-piece, easy-assembly design of our Premier Polysteel tree grates protects and prevents soil from compressing around the base of your tree, while letting in necessary moisture. Grates are shown here are 44 inches x 44 inches. These are built to the your size requirements. 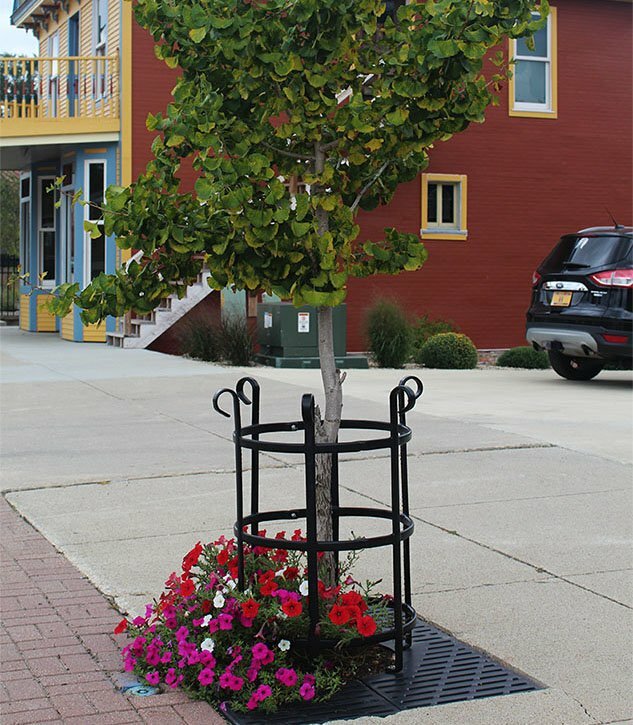 The attractive Premier Polysteel tree guard protects the youngest of trees from environmental dangers common to urban walkways, and provides a uniform look to any landscape design. We offer twelve standard colors. Custom colors are available for large orders. 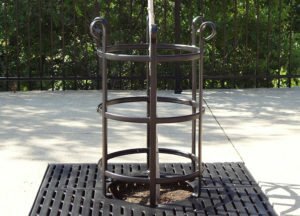 The tree guard pictured is 36 inches high with an 18 inch diameter. We will manufacture to your size specifications. Like all our other products, the tree protection grates and guards exceed performance requirements with their 100% poly-vinyl coated frame. Strong winds, high humidity, sand, heavy rain and salty air are no match for the products you select from us. A 1/8+ inch layer of poly-vinyl is bonded directly to the metal. Rust and corrosion will NEVER be a problem because our products have no exposed metal. This process continues to be a time-tested winner. 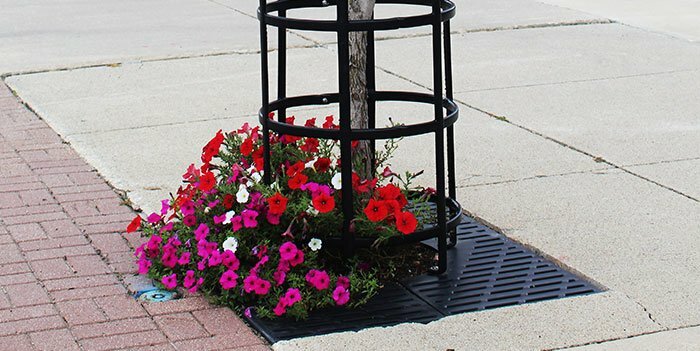 With our Industry Leading 20 Year Warranty, our tree protection grates and guards are a durable and attractive addition to any location which will look great for many years to come! Furthermore, these products are maintenance free and they are very easy to clean! Please contact us with any questions you may have or to place an order. On behalf of the City of Northwood we would like to express our sincere thanks and gratitude to the owners, staff, and employees of Premier Polysteel. For 20 years we have been a satisfied loyal customer as we have purchased picnic tables, benches, trash receptacles, swimming pool lounge chairs, tree grates, and bike racks. The construction and maintenance-free products have helped our city budget tremendously by saving the tax-payers money as there is no need for fixing or replacement of these products. They are durable, resistant, and remain rust-free. Some of our items are over 20 years and they have stood up the test of Iowa winters. Thank you Premier Polysteel for providing quality products, you are an asset to our community. All tree guards and grates have a 20 Year Warranty! 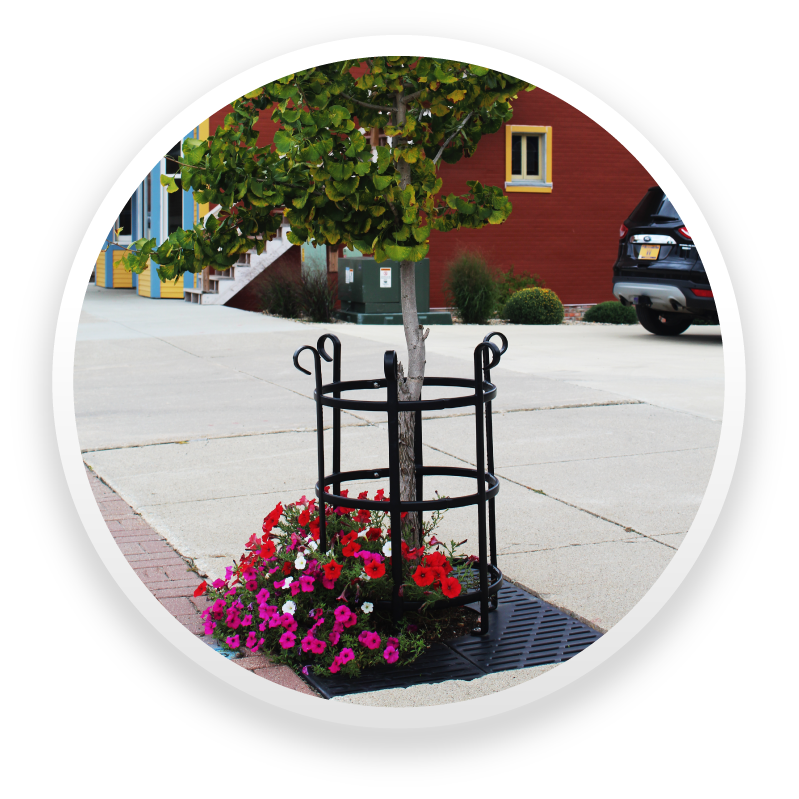 Every Premier tree guard and grate is coated with a thick layer of poly-vinyl for protection against all environmental elements. It’s a tremendous value with the added benefit of our Best-In-Industry 20-year limited warranty!